The workers of Sodastream has been forced out of the Jewish district of Judea, by the supporters of Islam. With two weeks to go before it clears out its controversial factory in Ma’aleh Adumin in favor of one in the Negev desert, Sodastream CEO Daniel Birnbaum on Thursday skewered the BDS movement as anti-semitic. “It’s propaganda, it’s politics, it’s hate, it’s anti-Semitism. It’s all the bad stuff we don’t want to be part of,” Birnbaum said. 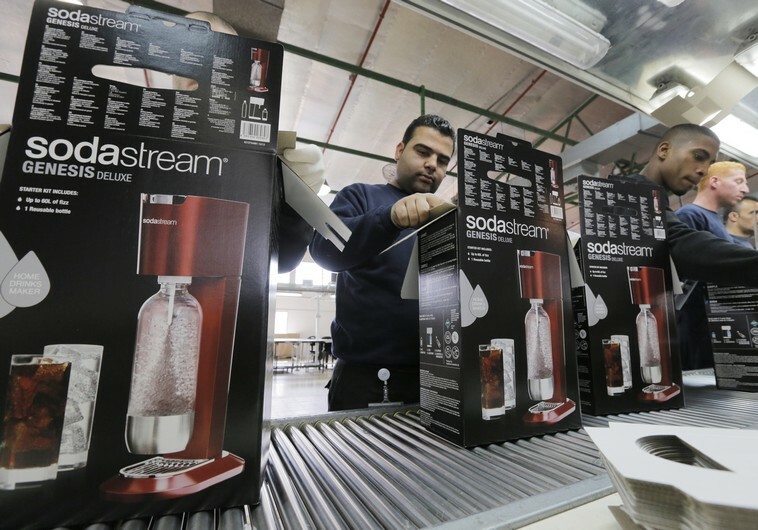 The SodaStream factory has been a central target for the Boycott, Divest and Sanctions movement, which claimed the decision to move out of the West Bank settlement as a major victory. Birnbaum, however, said that the decision was strictly business. Moreover, he said that the factory’s presence in the West Bank was good for Palestinians. The forces of Islam work hard to drive the Jews off the mountains of Zion. One of their tools is to intimidate and give threats to all who buy Israeli products made by Jewish settlers. The Bible is crystal clear. The jewish people shall come home, and they shall rebuild their ancient ruins. They shall settle on the Mountains of Zion. Jesus the Messiah has fulfilled this prophecy. All who fear God should rejoice and praise Him. Despite the sun shining, the people of the World live in utter darkness. They side with the wicked and false religion of Islam, and will have to face the most horrible consequences. When the age of grace is over, they will face the wrath of God and eternal damnation. Their mortal error was to reject the modern day work of the Messiah, and bid to curse His restoration of Israel. “Because you have had an ancient hatred, and have shed the blood of the children of Israel by the power of the sword at the time of their calamity, when their iniquity came to an end, therefore, as I live,” says the Lord God, “I will prepare you for blood, and blood shall pursue you; since you have not hated blood, therefore blood shall pursue you. Thus I will make Mount Seir most desolate, and cut off from it the one who leaves and the one who returns. And I will fill its mountains with the slain; on your hills and in your valleys and in all your ravines those who are slain by the sword shall fall. I will make you perpetually desolate, and your cities shall be uninhabited; then you shall know that I am the Lord. All who have traveled along the Dead Sea and southwards, can still smell sulfur. The whole landscape in Edom have the marks of catastrophic and apocalyptic events of ancient times. The Messiah warned us that it will be like this just before His second coming. We can expect total devastation as God’s wrath comes up on the whole Earth. For as the lightning that flashes out of one part under heaven shines to the other part under heaven, so also the Son of Man will be in His day. But first He must suffer many things and be rejected by this generation. And as it was in the days of Noah, so it will be also in the days of the Son of Man: They ate, they drank, they married wives, they were given in marriage, until the day that Noah entered the ark, and the flood came and destroyed them all. Likewise as it was also in the days of Lot: They ate, they drank, they bought, they sold, they planted, they built; but on the day that Lot went out of Sodom it rained fire and brimstone from heaven and destroyed them all. Even so will it be in the day when the Son of Man is revealed. Remember I loved you enough to warn you. So many the world over are so blind and believe the lies of satan. most think the hate started with Hitler but it started in Genesis. no fear of G-d in so many, and the road is wide for so many headed to hell. blaming Israel as they send so much to the PLO and all they do is try to defend themselves. as we Pray for the Peace of Jerusalem and help the Jews get home and try to help them in every way as we owe them a debt we could never repay but need to do all we can. He is bringing them home to protect them as HE said, they have received double for their sin. people need to stay in the word and keep on praying. preachers need to tell the people how Salvation came thru the Jews …double punishment will come to the apostasy preachers.. I know you get emotional related to these kind of issues. But how do you measure “double punishment”? Are there cerain sectors in Hell that are more horrific than others?